Katie Jarvis. Rebecca Griffiths. Carrie Ann Savill. Michael Fassbender. Kierston Wareing. Drama. Coming of Age. Women on Film. Romance. Cannes Jury Prize. Art House. Dance. Drinking/drunk. Recommended. Plucked from obscurity (well, Tilbury Town Railway Station mid argument with her boyfriend to be more accurate), Katie Jarvis plays Mia, a bored teen who lives on a council estate with her drunken mother and younger sister. 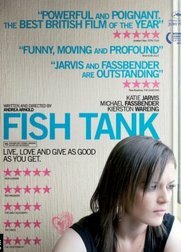 This is the second feature film from British critics' darling list of directors, Andrea Arnold, this time exploring teen angst and depravity to great cinematic effect, popular and critical acclaim. This DVD release also includes Arnold's Oscar winning short film 'WASP', often credited as the catalyst for 'Fish Tank'.